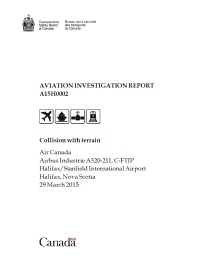 An Airbus A320, registration C-FTJP operating as Air Canada Flight AC624 from Toronto Pearson International suffered a landing accident at Halifax Stanfield International Airport (CYHZ), Nova Scotia. The airplane sustained substantial damage. 23 occupants were injured. Flight AC624 departed from Toronto at 21:05 hours local time (01:05 UTC). At 23:40 hours local time (02:40 UTC) the aircraft entered a holding pattern to the west of Halifax. Visibility was limited due to snowfall. The aircraft was then cleared for a Localizer (LOC-Z) approach to runway 05 at Halifax Airport. During final approach the aircraft severed powerlines located 250 m from the beginning of the paved surface of runway 05. The aircraft then impacted a localizer antenna array, located 70 m further on, and became airborne again. The Airbus slid onto the runway and came to rest near taxiway B. The nose cone was ripped off in the accident sequence and pieces of the antenna array were embedded in the nose of plane. Part of the undercarriage were sheared off and both engines separated. There was extensive damage to both wing leading edges and horizontal stabilizers and lower fuselage. The last flight landing at Halifax before the accident was AC118, an Embraer 190 from Ottawa, at 21:50 hours local time. Two other incoming flights diverted and two were cancelled. 1. Air Canada's standard operating procedure (SOP) and practice when flying in flight path angle guidance mode was that, once the aircraft was past the final approach fix, the flight crews were not required to monitor the aircraft's altitude and distance from the threshold or to make any adjustments to the flight path angle. This practice was not in accordance with the flight crew operating manuals of Air Canada or Airbus. 2. As per Air Canada's practice, once the flight path angle was selected and the aircraft began to descend, the flight crew did not monitor the altitude and distance from the threshold, nor did they make any adjustments to the flight path angle. 4. Considering the challenging conditions to acquire and maintain the visual cues, it is likely the flight crew delayed disconnecting the autopilot until beyond the minimum descent altitude because of their reliance on the autopilot system. 5. The approach and runway lights were not changed from setting 4 to setting 5; therefore, these lights were not at their maximum brightness setting during the approach. 6. The system to control the airfield lighting's preset selections for brightness setting 4 was not in accordance with the NAV CANADA Air Traffic Control Manual of Operations requirement for the omnidirectional approach lighting system to be at its brightest settings. 7. The limited number of visual cues and the short time that they were available to the flight crew, combined with potential visual illusions and the reduced brightness of the approach and runway lights, diminished the flight crew's ability to detect that the aircraft's approach path was taking it short of the runway. 8. The flight crew's recognition that the aircraft was too low during the approach would have been delayed because of plan continuation bias. 9. The aircraft struck terrain approximately 740 feet short of the runway threshold, bounced twice, and then slid along the runway before coming to a rest approximately 1900 feet beyond the runway threshold. 10. At some time during the impact sequence, the captain's head struck the glare shield because there were insufficient acceleration forces to lock the shoulder harness and prevent movement of his upper body. 11. The first officer sustained a head injury and serious injury to the right eye as a result of striking the glare shield because the automatic locking feature of the right-side shoulder-harness inertia reel was unserviceable. 12. A flight attendant was injured by a coffee brewer that came free of its mounting base because its locking system was not correctly engaged. 13. Because no emergency was expected, the passengers and cabin crew were not in a brace position at the time of the initial impact. 14. Most of the injuries sustained by the passengers were consistent with not adopting a brace position. Distance from Toronto-Pearson International Airport, ON to Halifax-Stanfield International Airport, NS as the crow flies is 1279 km (800 miles).